Change can be hard, but sometimes a good thing only gets better. That&apos;s what folks should know about the new ownership and name change when they drive past the old Pizza Paradise in Danville. 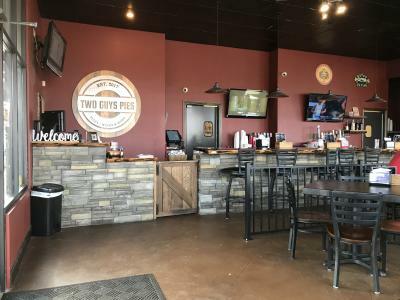 Late last year, new ownership purchased the popular restaurant and changed its name to Two Guys Pies - cleverly named after the birth of the new owners&apos; twin grandsons. I wasn&apos;t a first time patron when I ventured in for a weeknight dinner with (half) of my family last week, but it was the first time that I evaluated the changes since the switch. My family is composed of creatures of habit - not picky, but particular - and we don&apos;t always adjust to change very well. So, per our usual, we ordered the Family Feast -- pizza, breadsticks and soft drinks. Again, per usual, I added a salad bar... and a small BBQ chicken pizza. This was the first time I had tried the salad bar since the change in ownership. I piled a little bit of everything on my plate - leafy greens, olives, ham, bacon, egg, tomatoes, cucumbers, blue cheese, sunflower seeds and a mountain of cauliflower. The only thing worse than an absence of a salad bar is one that offers wet, slimy, brown lettuce. I&apos;m happy to report that the salad bar at Two Guys Pies offered fresh greens and a variety of toppings. It was easy to make a full meal of it. Add an order of breadsticks, because life is short. Our server, Barbie, was top-notch. She knew we were taking most of our meal home for our teens who were at evening activities. So, she suggested that in place of the four soft drinks that came with our family meal we order two soft drinks while we ate there and take home a 2-liter. I also watched as Barbie sacrificed a few layers of skin rushing piping hot pies out to waiting guests. Our youngest usually orders their boneless wings and loves them, but we stuck with pizza on this visit. We ordered pepperoni for the family and my small BBQ chicken. They don&apos;t skimp on the toppings at Two Guys Pies. Delicious. I ended up boxing my pizza, and the teens and I enjoyed it for lunch the next day. You&apos;ll find a variety of sandwiches, calzones and pasta dishes on the menu as well as a vast array of delicious appetizers. Order the breadsticks and thank me later. My family happens to celebrate the fact that Two Guys Pies serves red cream soda. Adults might enjoy a Sun King draft, a variety of bottled domestics or a glass of wine. For more information or to place a carryout order: (317) 745-6434 or visit their website or Facebook page for specials. 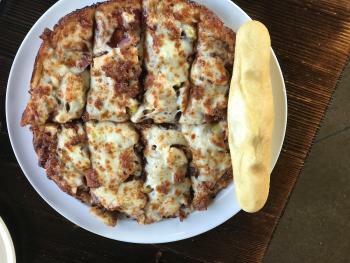 Whether you&apos;re looking for a light lunch or a good pizza and brew, Two Guys Pies in Danville won&apos;t disappoint.